In commemoration of the 100th anniversary of the passing of Queen Liliʻuokalani, Hawai‘i’s last reigning monarch, the Hawaiʻi State Archives is pleased to announce the digital release of the Queen Liliʻuokalani Photograph Exhibition. 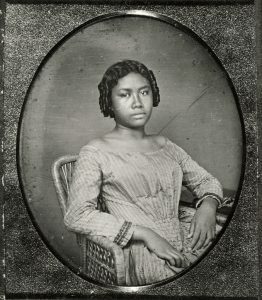 The 120 images in this digital exhibition contain all of the images found in the seven Royalty – Liliʻuokalani folders from the State Archives’ main Photograph Collection, presented as high-resolution preservation color scans. The original photographic prints, which are kept at the State Archives, have been reproduced with color calibration targets and are available uncropped at 1200dpi; or for ease of use, a cropped and lightly edited version has also been provided that is ready for printing. Along with the high-quality digitized images, the reverse of these unique prints have also been scanned to offer some contextual information about the image. Please note that the information written on the reverse of these prints has not been verified but presented for informational purposes only. As a reminder, the Hawaiʻi State Archives is a government institution, and therefore the State Archives does not charge permission fees nor claim the copyright to these images. It is the user’s obligation to determine and satisfy copyright or other use restrictions when publishing or otherwise distributing materials found in the Archives’ collections.